Maine regular firearms season on deer, barely pushed the mercury low enough to warrant the through testing of my new Irish Setter 800 "Mt. Claw-King Toe" boots. However, by the arrival of Christmas, we were thrust into the deep freeze and the balmy days of November were quickly distant memories. Maine’s weather is extraordinarily fickle and to be comfortable in these often rapidly changing environments, one must dress in layers and make sure to take excellent care of their feet. Whether hunting or ice fishing, having the right boots can make the difference between shooting a big buck, catching that monster pike or going home empty handed. Warm and dry feet allow sportsmen to be comfortable in the wilds and spend their time concentrating on the task at hand and not expressly worrying about their feet. Want to have a miserable time in the Maine woods, spend the day with cold wet feet. To combat this issue, it pays to pick your boots, dependent on the intended task at hand. Sitting in a deer stand motionless in 10-degree temperatures, ice fishing, backpacking, still-hunting, all require specialized boots. Too much boot and feet sweat and leaving you wet feet and blisters, too little boot and you could potentially loose a toe to frostbite. It is no secret I am a bit of a boot aficionado. My love affair with foot wear, is directly linked to the wild changes that occur in Maine’s seasonal temperatures and a personal pursuit of a wide variety of different outdoor sporting hobbies. 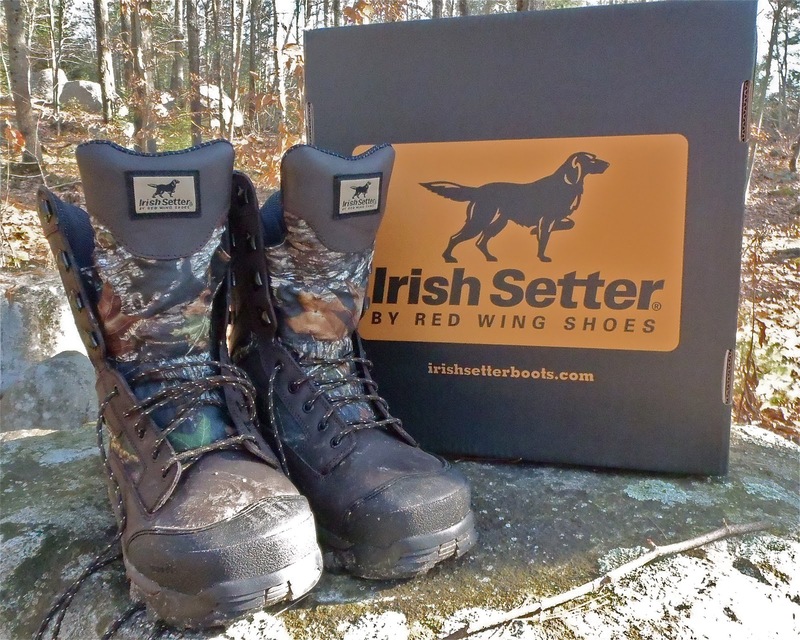 Irish Setter 800s Balance Mobility and Warmth! The latest arrival to the collection of assorted footwear is a lightweight, comfortable and warm hunting boot constructed with care by the folks at Irish Setter. This is a fine example of a “niche” boot, perfect for certain tasks, where it would be impossible for other footwear to succeed. Wear heavily insulated arctic boots built for ice fishing and you keep feet warm but lose mobility, when navigating thick spruce thickets and briar patches. Wear light weight leather hikers and gain mobility but lose warmth. The balance is stuck with the lightweight Irish Setter 800s that fit more like a sneaker than a “boot”, yet with 800 grams of insulation still provide adequate warmth on days when the mercury dips low. The test area is an icy cold later December morning. The temperature on the thermometer reads 15 degrees Fahrenheit. My feet wrapped first in a thin perspiration wicking polypropylene sock and secondly with a thicker smart wool sock, rest comfortably in my Irish Setter 800s. Stepping off my deck onto the newly fallen snow, it creaks and groans, as if these boots are its enemy. I choke back a laugh thinking that perhaps they are. I exhale a breath from deep within my chest and the hot wet vapor freezes instantly . . . it is the perfect early morning to hunt rabbits. I doesn’t take long to notice the familiar tracks of Maine’s varying hare and I follow them into a thick swampy spruce cover. Its slow going, through the thick cover and the ice covering the swamps hidden wet holes is thin. Suddenly my foot breaks through the ice and plunges into the frigid water almost to mid calf. Fortunately, the water does not exceed the height of the boot upper and my foot remains dry and comfortable. After about 3 hours of walking mixed terrain, it appeared that perhaps Mr. Rabbit would win this battle. However, the good hunter remains vigilant until the very end and as I turned to go home, a single hare burst out of a spruce thicket and straight away from me. I raised my shotgun and fired and one more rabbit would be added to my stew pot. Good boots helped me be able to concentrate on hunting and not expending my mental energies on worrying about cold feet . . . another successful hunt thanks to my Irish Setter 800s. Interesting boot. Did you feel like they were heavy or bulky while you were hiking and was there much support? How about the traction? Does it have good lugs on the bottom? Are those eyelets or hooks where they lace? Are they double stitched? The toe looks smaller than your other pairs. Do you think it would fit in a stirrup very easily? Mia, EXCELLENT questions . . . thank you for commenting! 1. No, these boots are warm and light and strike an excellent compromise between my "heavy" weight ice fishing/late season "stand" boots (that make me look like I have Mickey Mouse feet) and my "light" weight leather hikers or LL Bean boots that are quick and nimble but provide almost NO warmth. The boot comes up to mid calf and provides support but also flexes when hiking up steep trail sections. 2. Funny you mention the traction. I was leaping across a boulder field and noted a rock with a steep face. I decided to "chance" the jump and prepared myself for the impending slip. It never happened....I was quite amazed. After that, I tested them a few more times on a few different surfaces with the same results. 3. Lugs provide good traction AND at the same time to not seem to hold to much mud, dirt and grime . . . I tested this by walking through some mud in the backyard and then across the living room rug. Wife only gave me the stink eye rather than a verbal beating so I rate them as "pass". 4. Bottom is eyelets and upper is hooks. They are fairly quick on and off. 5. Yes, double stitched. Construction seems rugged. I am VERY hard on gear so this next year will be a good test. 6. HA! Cannot tell you if they will fit in a stirrup but I can tell you that my big toe La Crosse boots WILL NOT allow me to easily shift an ATV while these boots will. Final word: When the mercury plummets during the height of the Maine winter and you are sitting motionless on a coyote blind or are standing on the ice ALL DAY these are NOT the boots to wear. If moving at any MAINE temperature or not moving down to about 30-35 these would be good boots . . . . lower than that and I would bring out my BIG BOOTS by La Crosse! The hubs has a pair pf setters, but his feet always go cold before my danner Pronghorn camohide gtx clad feet. They are a little pricier, but it might be something worth trying out next time you have boot fettish fever. I'm a girl so some of the props I give them might not count in your book :-) like the pretty buttery leather they are made of, and how the back is more contoured around the calf area. They also offer amazing support while beIng moderately lightweight for a insulated boot. I do choose these for 3-5 mile hikes over my hiking shoes. Oh yeah, and they come in women's sizes. Thanks for the review on your setters. Hi Loni thanks for stopping by and commenting! The price point between the Danner Pronghorn ($200) and the Irish Setter 800s ($140) is considerable. Not in ALL cases BUT certainly in MOSt the more you spend on Gloves, jackets and especially Boot the better the quality and the longer they tend to last. However, I will be sure to keep an eye in the future on the possibility of adding a pair of Danners to my boot collection! Yes, the "pretty buttery leather" means little to my go camo or go home motto! LOL! BUT I am sure that other readers on my blog will much appreciate your "girl" perspective. That's a great spot for an Air Wick! IF you have a 'boot fetish' you'd be hard pressed to find a better value than a pair of Limmer Boots from the factory in Intervale, NH. I've had my pair of Standard Limmers (off the rack 'stock boots', not customs) in near constant use since 1984. (yeah...almost 30 years.) This includes my using them in preference over my Army Issued 'Mountain Boots' when I was stationed in Ft. Greeley, AK from 86-87. They've been resoled and refitted a few times and they did initially cost a good bit of money, but in the end, one of the best clothing investment's I've ever made. Top photo last set of boots on the right are "off the rack" Limmer bought right in good old Intervale NH! Mine are still going strong after almost 15 years of hard use! Thanks for commenting!